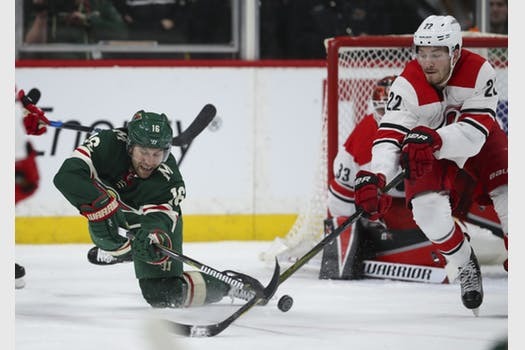 RALEIGH, N.C. – Just two weeks ago, the Wild was in a similar situation – finishing off a back-to-back after an emotional win against one of the NHL’s premier teams. It sagged in that encore, getting steamrolled 6-2 by the Florida Panthers one night after shutting out the league-leading Tampa Bay Lightning 3-0. And coach Bruce Boudreau is hoping that memory helps the Wild avoid another letdown Saturday when it visits the Hurricanes in Carolina only hours after edging the Washington Capitals 2-1. The Wild could be forced to mix up its lineup. Winger Zach Parise was clipped by Capitals winger Tom Wilson in the third period Friday, falling to the ice and moving slowly to the bench. Parise, however, was able to return, and he set up the game-winning goal by center Luke Kunin. The team could slot winger Pontus Aberg into the lineup if needed. “It’s going to be a game-time decision [on] lineup changes because of people not feeling as well as they were supposed to be feeling,” Boudreau said. This game marks the first time these two teams have met since they swapped forwards in January, a trade that sent winger Nino Niederreiter to the Hurricanes and center Victor Rask to the Wild. 500: Career games for winger Marcus Foligno. 7-2-1: Goalie Devan Dubnyk’s career record vs. Carolina. 3-1-3: The Wild’s record in its last seven games at PNC Arena. 6-5-3: Record for the Wild in the second half of the back-to-back. 24: Goals by Wild rookies, which is tied for fifth in the NHL. Carolina occupies the first wild card seed in the Eastern Conference with 87 points, two ahead of Montreal. It’s reached 40 wins for the first time since 2010-11. The Hurricanes are 25-9-2 in their last 36 games, which is the second-most wins and tied for the third-most points in the NHL since Dec.31. Center Sebastian Aho leads the team in goals (30) and points (79). Both are career-highs, along with his 49 assists.